Share the post "Solve House Training Problems Fast – Dos and Don’ts"
Are you having house training problems with your puppy? Is your puppy pooping and peeing in the wrong spots? Are you having difficulty timing your puppy’s bowel movements? Here are a few tips to help you solve house training problems – fast. The first thing you need to do for your puppy is to pick one method and stick to it. Most house training problems occur because of inconsistent methods and inconsistent training schedules. Dog House Training — With Bells? Share the post "Dog House Training — With Bells?" Believe it or not one of the easiest ways to house train your new puppy so you know when they have to go to the bathroom is by having them ring bells. Despite what you may be thinking dog house training with bells simply works. And it works well. Certain breads of dogs, especially the smaller breads, tend to be very difficult to house train. You can try buying all of those fancy step-by-step books. You can buy your puppy every dog treat and bone ever made on the market. You can bribe your puppy with the best toys a man or woman can buy. But that does not necessary mean you will be able to break through to them and get them to finally learn to be house trained. Instead what you need is a set of bells. First, you need to buy a set of bells that hang on a leash like rope. These bells can be bought at any pet store or online site such as Amazon. Simply search dog house training bells and you will pull up a whole list of available products in a multitude of colors. Simply choose the correct length for your door handle and in a color you would like and that you think your dog would like. The second step after you purchase the bells is to hang them on a door where you would like your dog to alert you each time they need to go out. (Hint: if you have a two story house, it may be beneficial to have two sets of bells, one for upstairs and one for downstairs). Make sure they are within reach of your dog’s paw(s). The third step is each time you go to take your dog out from now on, first bring them to their bells, give them their “go outside” command that you use, use their paw to ring the bells, and then proceed to take them to the bathroom. Rewarding your dog with a treat after a successful outdoor potty will add that extra touch. 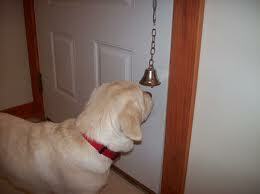 Continue step three until your dog learns to ring their bells on their own to alert you that they have to go out. Even the most stubborn of dogs seem to pick up on this one rather quickly. Get a pair of bells today and put dog house training in the past. Dog House Training -- With Bells?